Michael Donovan of SLE Ltd., the SLE series’ creator, shared the episode of research and development of these excellent ventilator models. SLE series are a group of extremely unique ventilators without expiratory valves, designed after Jackson Rees airway. The valveless system was adopted primarily because it will decrease expiratory work of breathing. 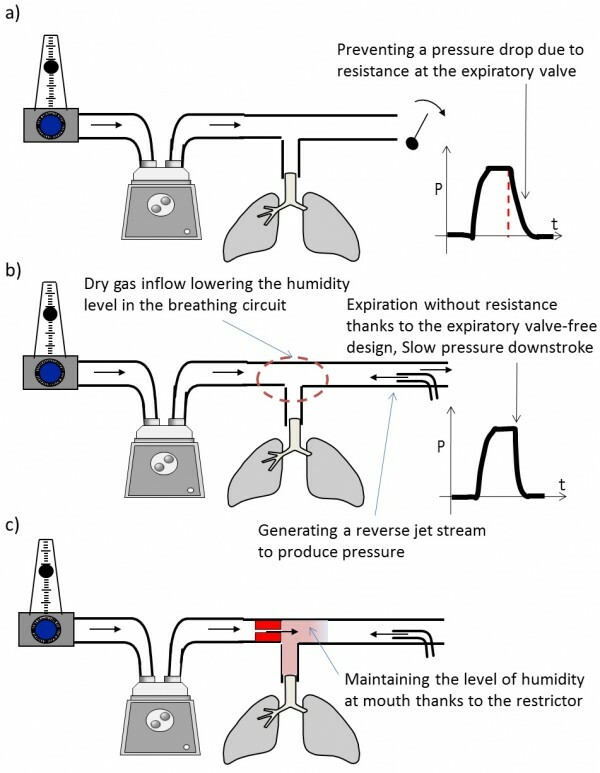 Usual constant-flow type ventilators with expiratory valves impose respiratory resistance on babies, which SLE series ventilators are designed to avoid. The gas breathed out by a patient is directly expelled through an expiratory circuit with no narrowed part and PEEP is maintained by a reverse jet flow generated from an expiratory block. During the inspiratory phase, the expiratory block generates even stronger reverse jet flow to provide ventilation. However, it should be noted that the dry gas from the expiratory limb lowers the level of humidity in the airway circuit. To resolve this, a restrictor is added at the patient side of an inspiratory circuit to prevent the dry gas from being delivered to a patient. As such, the original concept produced SLE2000. Three years after the development of SLE2000, SLE2000HFO was introduced in which the restrictor also plays a significant role. As described in the article No.5 of this series, “SLE2000HFO”, this restrictor functions as a “wall” and bounces back the vibration during HFO. As a result, HFO oscillation can be delivered without attenuation even when a disposable circuit is used. Unfortunately, the mechanism of SLE series cannot be applied to adult ventilators because the issues related to large gas consumption of adult patients, ventilatory volume, CO2 rebreathing and expiratory resistance in the expiratory circuit cannot be solved readily. In order to avoid CO2 rebreathing, a narrow expiratory circuit is necessary but it will increase expiratory resistance.